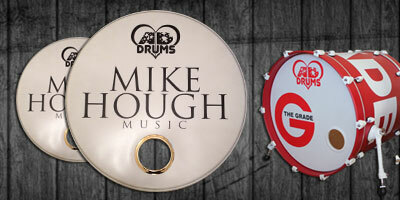 The page shows just a snippit of what we can do with our custom drums, we offer a full design service and can help out if you require advice on your ideas, If you can dream it up we can make it happen, so far we have not let anyone down. As long as it will bend around a drum shell and allow heads to fit we can wrap shells in all manor of wraps here are a few commons and very cool wraps available. Glass glitter,Sparkles, Oysters, Ripples, Pearls the list goes on. 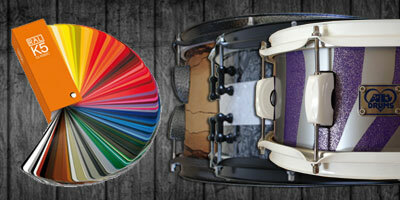 All wraps can be pinstriped with a variety of different ways, virtical, horizontal and diagnal. All of our stains are mixed and made in house using our own range of pigments allowing us to mix any colour in the world, all at the drop of a hat. We have spray equipment to ensure all paint is applied perfectly, flat/gloss colours, sparkles, flip paint the pallet is vast so get in touch with your ideas and we can make it happen. We can also pinstripe and fade any paint or stain work to give it that unique edge. 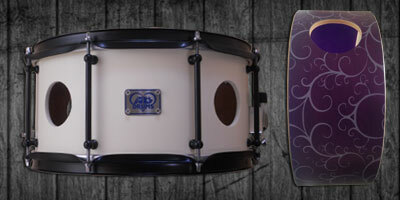 We can add any type of hardware to our drums but we do stock a range of what we feel are very cool, modern looking lugs. 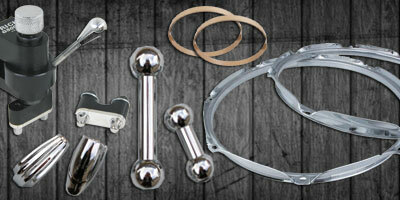 All our kits boast 2.3mm power hoops, deluxe spurs and heavy duty brackets as standard. All hardware within reason can be altered to fit a specific design. The perfect addition to compliment the design and style of your kit, we can powdercoat in almost any colour, some cool effects can be created if you mix and match. 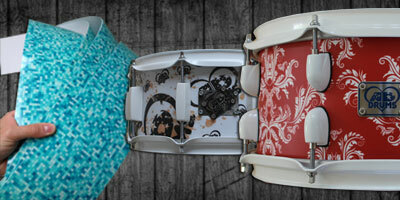 We can also coat your old parts if you are looking to pimp up your old kit and give it a new lease of life. We offer custom head decals as well as funky designs that can be applied to most areas of the given kit, we work very closely to make sure we make good clean design work with what ever media we feel will work best. Anything from band logos to custom logos,stripes,patterns can be made just for you. All designs and made in house. 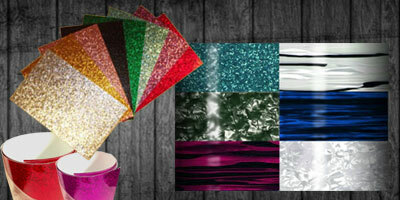 After spending years in the printing industry we now offer full custom printed drum wraps and graphics all in house using our large format printer, this has been a dream and after alot of R & D we can now say we have cracked it. Any thing is possible, all artwork is done inhouse too so you get the exact one off wrap that is unique to you. 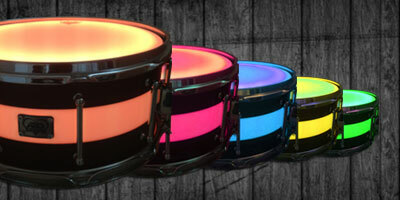 Using the power of LED technology we can turn your kit in to a light box of colour and visual bliss. 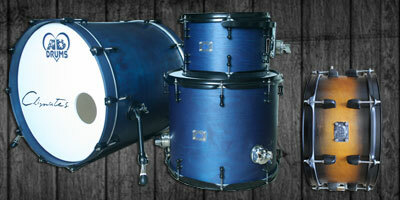 Not only limited to hybrid and acrylic drums we can also install in to standard wooden kits & snares. Vents and Splits are what can dramatically change the way a drum sounds and feels to play, the larger the vent the louder the snare, in most cases this also causes a dryer tone, perfect for being heard above everything else. We can cut many shapes and sizes.